I've finally put my last litter box inside of cat furniture! Litter hasn't been getting into my bed for several weeks now, guys! This is so awesome! This is the third piece of litter box furniture that I've made. This one is the most expensive (at about $65) because it's also another cat tower. Click here to read about the other two, which cost $40 and $26 for me to build! I've also built my own giant cat tower for under $60, which you can read about in a series of posts starting here. Looking back on those posts, I am impressed by how the quality of my photos have improved in the past three years, though they still could use improvement. My wonderful friend Max helped me make the beginning woodworking cuts to the furniture. Secret: I love being able to make my own furniture, but I don't actually enjoy woodworking very much. I was quite glad to let him do some of it! The big drawer in the bottom was removed and cut down so that it was just a front (we left an inch of the drawer so it would have something to rest on when we glued the front of the drawer back into it). Two holes were cut - one on top (being cut in the above photos) on the right side, and one below the drawer on the left side. This way the cats have to travel over the middle step (the right half of the bottom of the drawer) before jumping out, which helps to get the litter off their feet. The litter box lives behind the bottom doors. This makes it easy to clean - just open the door, pull out the litter box a bit, and scoop! The top half was made into the cat hangout area (cat tower). I cut squares out of the sides by each of the shelves. The drawers were again removed and cut down, with only the fronts glued back onto the structure. I used two old rugs in making this. A long green one was cut in half vertically. It was glued and stapled to the sides, with the raw cut edge on the back. Then I used a knife to cut the square doors out of the sides. 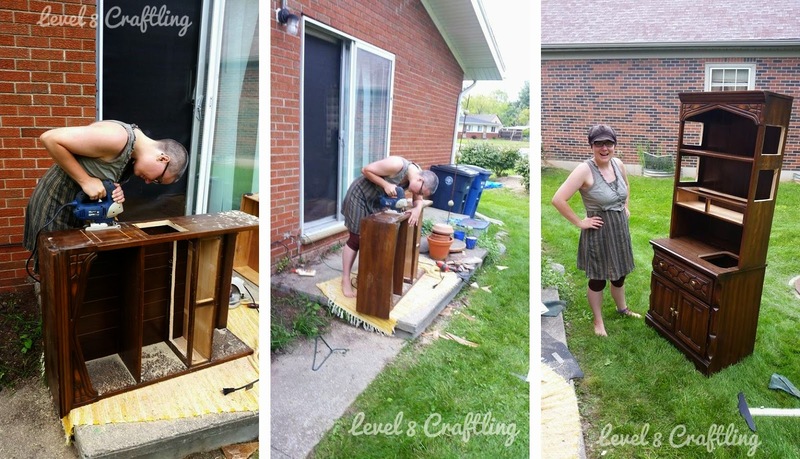 Next is the before and after of carpeting the box shelf! By removing the drawers and gluing their fronts back on, I made a cozy box for the cats to play in. Below you can see half the brown carpet that I used for the top of the bottom litter box portion of the tower. There is a raw edge around the opening to the lower litter box, and a raw edge against the back. Gnome was having fun rolling around on this while her brother played above. It's important to add carpeting/rugs to these two layers above the litter box - it seriously cuts down on the amount of litter that gets out into the room. My cats love to spring quickly out of the litter box when they are done, spraying litter everywhere in the process. The carpeting catches most of it from the spray and from their paws as they walk over it to escape. The raw edge bothered me, so I added a layer of fabric around the edge. It's stapled underneath and hand-sewn to the carpet above. The cats always think thread is fascinating! Can you find the second cat in the picture below? All finished and fun for the cats! Here's the overall photo again. Cost: $52 for the furniture from the Ann Arbor ReUse Center, $6 for two rugs from a thrift store (I forget which one), and a few dollars for some hardware supplies. Between $60-65 total. At some point I plan on adding a bit more carpeting to the top two levels, along with making some cat beds to put there. I'm really happy how this has improved my bedroom: from an open litter box on the floor, which got litter everywhere (including on my bed), to this. I tried to leave as much of the original wood exposed as I could, because I think it's just gorgeous.